Thanks to advancements in the fields of transport and communications the world is increasingly becoming smaller. In fact, the world is now called a ‘global village’. If an incident occurs in the United States or India, it has an impact on the whole world. Today, no society or nation can exist in isolation. But this way of living calls for a greater responsibility on our part. It is imperative that children should know about themselves and their environment. Keeping this objective in mind our series ‘Social Studies for Juniors (Books and Books 1-5)’ for Primary Classes has been created. The course consists of a Course Book and an Activity Book at each level. This series, in a gradual manner, introduces the child to the wider world — beginning with home, family, neighbourhood, country and so on. Special emphasis has been laid on creating an awareness about the environment in the child. By going through this series, the child will not only know about his/her country and its rich heritage but also about the cultures of other countries. It will enlarge his/her vision and make him/her develop qualities required for a good citizen. Layout is child-friendly with simple and straightforward text. The text is complemented by attractive illustrations, captivating photographs and well-designed maps. At the end of each lesson, under the heading Word Power, difficult words and their meanings have been given. This will facilitate quick and clear understanding of the text. Ample exercises and activities have been given to develop logical thinking and observation power. Model Test Papers at the end of each book check the retention capacity and the level of understanding of the children. This series is accompanied by Activity Books (1-5). 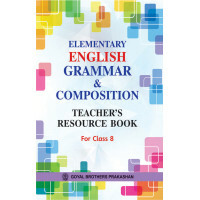 The activities in these books help cement the concepts learnt in the Course Book.